Meet the indigenous Uros people of the floating islands and Taquile Island on Lake Titicaca. 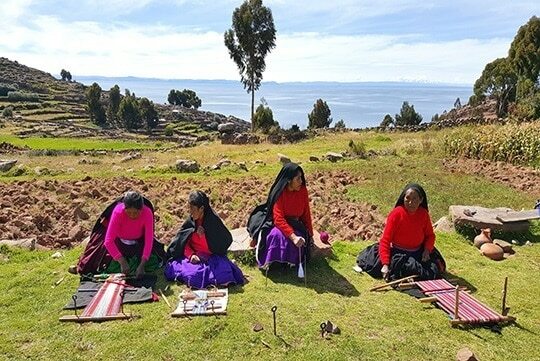 Experience Local Living and culture on Chicuito peninsula (Luquina Comunity); Majestic Lake Titicaca Experience is the best program to experience the real local living in Titicaca. Majestic Lake Titicaca Experience it is not just a simple trip; it is living culture. the top of a nearby hill for an unforgettable Titicaca sunset. After dinner enjoy a small celebration with traditional music and dances. Overnight at the Home stay; It has basic but comfortable facilities, good mattress, blankets & sheets, sheets, private toilet. Have breakfast at your home stay and spend the morning learning about daily life at Lake Titicaca. You may help take the sheep or cattle out to graze or garden if the season is right. You can take walks, hikes or just a rest by the shores of Lake Titicaca. After a delicious lunch, you will return to the port to catch your boat back to Puno. End of Majestic Lake Titicaca Experience! For more information please contact us and we will be happy to help you! Share your experience of Majestic Lake Titicaca Experience.